The unique exterior of a wine store near the Cours Saleya market in the Old Town of Nice in Provence, France in Europe. Nicely decorated flags adorn the exterior of this building which hang above the logo for this wine store in the Old Town of Nice in Provence, France in Europe. The windows are decorated with different items needed for storing wine while large wooden barrels known as kegs stand on either side of the doorways. The entire display sends off an aura about wine before even entering the store.Once inside the wine store, there are shelves lined with different makes of wines, some of the best in France, utensils needed for making wine, wine gadgets and hundreds of other items all dealing with the industry. For true wine lovers, the wine store is a place you do not want to miss while visiting the Old Town of Nice.Wine Store in the Old Town of Nice near Cours Saleya, Provence, Cote d'Azur, France, Europe. 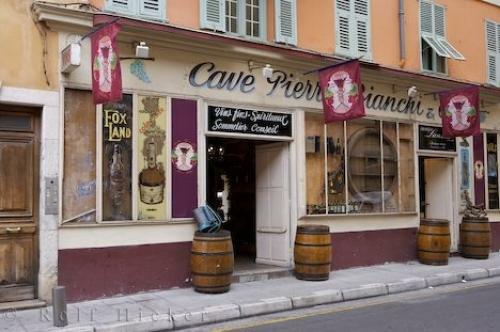 Photo of the exterior of a wine store along the Cote d'Azur in the Old Town of Nice in Provence, France in Europe.